Our reputations often precede us—but, in the case of these television characters, reputation is all they have. Here are 11 TV personalities that are often talked about, but rarely (if ever) shown on screen. What they're saying: "Did you see Heather Sinclair's eyebrows? Tragically overplucked!" The lowdown: For a time, the Queen Bee of Degrassi never appeared on camera—but was often the subject of gossip nonetheless. "It felt very high school to me to see someone's reputation created through bits and pieces of gossip, without ever meeting the legend herself," says Matt Huether, a Degrassi co-executive producer and writer. "If we'd seen her, it's hard to believe she could have lived up to that reputation." In the seventh season, the series introduced a new character, Holly J. Sinclair—Heather's younger sister—but her big sis still never made it on screen. "We thought this might give us the opportunity to one day meet Heather Sinclair, through Holly J., and we discussed many times over the course of several seasons doing some stunt-casting and bringing in a high-profile guest star to play Heather for a scene," Huether says. "Anyone who was blond and famous from 2007 through 2011 was mentioned. Ultimately, we never committed to it, perhaps because we didn't really want to see the real her." What they're saying: "Did the president call?" The lowdown: It's hard to believe the fictional president of the Veep universe won an election, considering the low profile he's kept. He's never seen on screen, his party affiliation hasn't been mentioned, and he doesn't even have a name—the other characters just refer to him as POTUS. Then again, that absence is symbolic of the veep's place in the D.C. pecking order. "You'll never see the president," star Julia Louis-Dreyfus tells NPR. 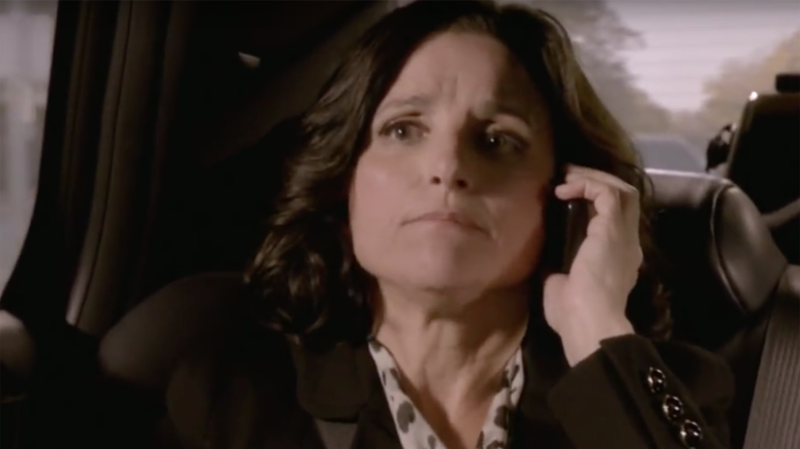 "We're depicting a situation in which that relationship is highly dysfunctional, and the president is very much trying to keep this vice president, Selina Meyer, an arm's length away." Meyer often asks if the president has called for her—and the answer is always no. What they're saying: "We have to go! With Sharon, to the hospital. I'll get Tino to drive us, he loves hospitals." The lowdown: It's possible My So-Called Life heartthrob Jordan Catalano never got anywhere with his band, the Frozen Embryos, because Tino, its front man, wasn't very present. Then again, maybe he didn't have to be: possibly the most-referenced unseen character on this list, Tino is mentioned in a majority of the series' episodes, by almost every major teenage character. He can get a fake ID. He can get into an exclusive club, loft, or empty, for-sale house. He is, like, Mr. Halloween. When he quits the band, Jordan laments that "There's gonna be, like, this big empty hole where Tino used to be," but, for the audience, that's all he ever was. What they're saying: "She distrusts anything that loves her unconditionally." The lowdown: "Everybody has their own vision of what Maris looks like," Frasier executive producer Peter Casey says in an extra feature included on the second-season DVD. "Frankly, with some of the things that have been written about her in the scripts, I don't know if we could ever find anybody that could match all those things." It would be hard to find an actress who fits the bill, considering Maris is described as extremely slight (her ideal weight is 45 pounds, 12 ounces), addicted to plastic surgery, and easy to mistake for a coat rack. What they're saying: "My friend Bob Sacamano had shock treatments, but his synapses were so large—had no effect." The lowdown: Seinfeld's Kramer is always going on about his friend Bob Sacamano, from lamenting his case of rabies to crediting him with inventing the idea of attaching a ball to a paddle with a rubber band. (Before him, "people would just hit the ball and it would fly away.") Does the name "Bob Sacamano" sound too perfect to be made up? That's because it is. Starpulse reports that the rat-fur-hat salesman is the creation of Seinfeld writer Larry Charles, who borrowed the name from a real-life friend. While some would be flattered to achieve immortality through Seinfeld infamy, apparently the real Bob Sacamano was not. According to Gunaxin Media, after "The Heart Attack," the first time the character is mentioned (when we learn about how a botched hernia operation left him with a high-pitched voice), the real Sacamano had a falling out with Charles over the use of his name. No word on whether or not Lomez felt the same way. What they're saying: "Diane, if you ever get up this way, that cherry pie is worth a stop." Woody: "Hey, Mr. Peterson, what do you say to a cold one?" Norm: "See you later, Vera, I’ll be at Cheers." The lowdown: Maris wasn't the first character in the Cheers universe to eschew the spotlight. And, as with Niles and Maris, barfly Norm Peterson often talks about his wife in less-than-flattering terms, implying that he frequents the bar to stay away from her. Although the audience never gets to see Vera's face, they do hear her voice a handful of times (and see her full body once, with her face obscured by a smashed pie). Both the voice and the body were provided by Bernadette Birkett, the real-life wife of George Wendt. What they're saying: "Sooner or later, Lars is going to get tired of her. And he'll come back to me. And then I'm going to punish him for this." The lowdown: Lars Lindstrom, the dermatologist husband of Mary Richards' landlady, Phyllis, didn't need to show up in person to make a big impact on the series. In a fourth-season episode—titled "The Lars Affair"—Phyllis discovers he's cheating on her with Sue Ann Nivens, star of The Happy Homemaker on Richards' WJM-TV. Not only does this have big consequences for the plot, it shapes the series in general: the introduction of Nivens was Betty White's debut on the show. Outside of The Mary Tyler Moore Show, when Phyllis gets her own spin-off, Lars is still a no-show—the series takes place after he's died. What they're saying: "There's nothing half so sweet/As Juanita, Juanita, Juanit." The lowdown: Mayberry may be populated with lots of colorful characters, but two of them—both creations of producer Aaron Ruben—are never shown on screen: Sarah, the telephone operator, and Juanita Beasley, the waitress at the Bluebird Diner and sometime object of Barney Fife's affection. In the book The Andy Griffith Show, author Richard Michael Kelly writes: "They reminded Andy Griffith of the old radio show Vic and Sade: 'They originally had only three characters—later four—but they talked about their town and other towns nearby, and you never met any of those people. But their talk made you believe they were there.'" Wally Cleaver: "Hey Beav, isn't that Angela Valentine the one that's always showing the kids her extra toe?" Beaver: "Yeah, but everybody's used to seeing that, so now she eats library paste." The lowdown: It seems that Beaver often comes home with tales of his phantom classmate, whether he's reeling from her getting sick in the back of the school bus to reveling in triumph that ensues after she enlists the entire class to help find her lost bike plate. Though she's mentioned at least a dozen times in the series, she's not entirely unseen. In the third-season episode "Baby Picture," Beaver's teacher addresses the class about an upcoming beauty pageant—giving credit for the idea to Angela Valentine, whom she acknowledges with a head nod. Of course, the class is only shown from the back.